You know how there’s mac and cheese, and then there’s mac and CHEESE? Well, this mac and cheese falls into the latter category. It was a dish that has been a long time coming on eating/sf. After all, there are few things I love more in this world than carbs and cheese, baked together into gooey, generous single-serving goodness. I’ll often get fixated on a dish and spend the next few days religiously searching every cookbook and food site for contenders. I’ll compare the reviews, the quality of the ingredients, take into account prep time, and ingredients that I already have on hand. I’ll then think about how to make it better. Three years ago, I would not have thought specifically that truffle oil makes things better, but once I started tossing it into pastas, soups, stir-fried mushrooms and mashed potatoes, I realized that truffle oil can be a secret ingredient that sounds incredibly fancy, but is actually quite accessible (I bet your neighborhood Trader Joe’s has it in stock). As I mentioned in a previous post, I’m serious about cheese. So you better believe I wasn’t about to settle on just any old mac and cheese. This truffled, three-cheese mac and cheese is not for the faint of heart–let me warn you. Gruyere, sharp cheddar, and brie all meld together to create the creamiest cheese sauce, and the splash of truffle oil enhances its flavor to the Nth degree. I made my mac and cheese with whole wheat penne, but regular ol’ pasta will do. The whole wheat penne holds up pretty well in the oven, but if you want something less textured, you might consider thinner, smaller pasta. The bread crumb topping is definitely a must–it gives every bite a perfect crispy bite, and soaks up some of the cheese sauce. I highly recommend making your own bread crumbs, but if you don’t have time, you could certainly get away with store-bought. So, this might just be the best mac and cheese I’ve ever had. I say ‘might’ because I’d like to leave the door open for better in the future. But I’d love to hear about the best mac and cheese YOU’VE ever had. What was the secret ingredient? Was there anything particularly unusual about it? 1. Combine all of the cheeses in a bowl and set aside about 1 cup of cheese for topping, placing it in the refrigerator. Pre-heat the oven to 375 degrees F.
2. Melt 2 tablespoons of butter in a large pot over medium heat and stir in the flour until it turns a golden brown and gives off a slightly nutty aroma (about 4 minutes). 3. Add in the thyme and nutmeg, and whisk in the milk, letting it simmer until thickened (this will take longer if you are using lowfat milk–be sure to stir so as to not let it curdle). 4. Now add the cheeses, stirring until smooth. Stir in the truffle oil, salt and pepper, to taste. 5. Melt 1/2 tablespoon of butter in a medium sized skillet over medium-high heat and add in the breadcrumbs, tossing and stirring until they are golden. Remove from the heat and transfer to a plate or bowl. 6. Cook the pasta, al dente and drain, transferring to a large bowl. 7. Pour the cheese sauce over the pasta and toss to combine. 8. 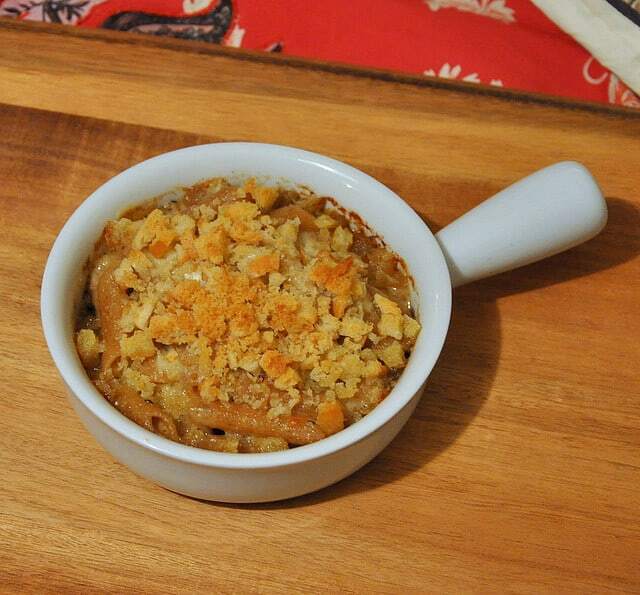 Next, divide the pasta into individual-sized au gratin dishes, or ramekins. Pour any remaining cheese sauce on top. 9. Divide the remaining cheese amongst the 4 dishes. Top with breadcrumbs. 10. Bake for about 20 minutes, until the pasta begins to bubble and the crumb topping is golden, but not burned.